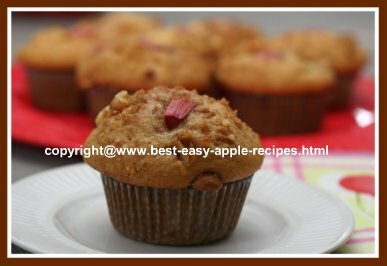 This recipe for Rhubarb Apple Muffins makes amazing, moist and delicious muffins for a healthy breakfast or brunch idea. Rhubarb is a vegetable, and apples are a fruit, so here you have a muffin with both a fruit and a vegetable! This apple muffin recipe makes about 18 medium-large muffins. You can freeze leftovers for future lunch bag additions. 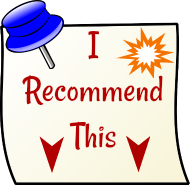 I made these muffins last weekend, and they turned out amazing...an excellent choice! Note - You can use fresh or frozen rhubarb for this recipe. If you use frozen rhubarb, thaw it first using a sieve, over a bowl. Discard the excess liquid. Using the topping ingredients, combine the brown sugar, cinnamon and nuts, and set aside. Combine the brown sugar, oil, egg, and vanilla in a bowl, and beat on "low" speed. Add the flour, baking soda and salt alternately with the buttermilk, mixing on "low" speed just until the ingredients are well combined. Fold in the apples and rhubarb pieces. Fill greased or paper lined muffin baking trays about 3/4 full. Using the prepared topping mixture, sprinkle each muffins in the baking tray with the topping. 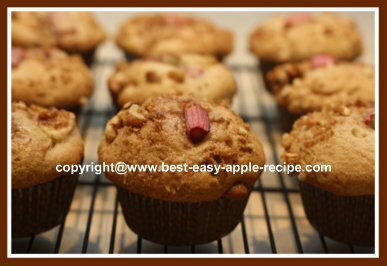 If desired, add a piece of chopped rhubarb to the top of each muffin before placing baking them. Bake at 325° F for about 20 - 25 minutes, or until golden. Yield: 18 medium-large size rhubarb apple muffins. 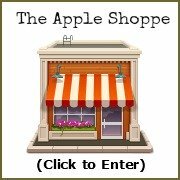 Visit my "sister-site", Rhubarb-central.com for hundreds of free rhubarb recipes - a website devoted only and entirely to RHUBARB! 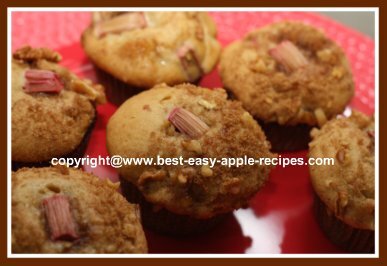 Here are options for many more rhubarb muffin recipes.